Want to connect with Ryley? Painting walls & Trim & Ceilings is my job! Also can conduct Sale's intakes and out bound job! 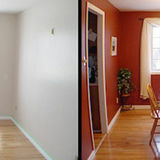 My name is naweed and I do Interior and exterior painting . Residential and commercial. Fully inssured company.